and Sharing Wheels needs your help to fix up bikes for low income kids. For over 10 years Sharing Wheels has been giving bikes to Christmas House and this year will be no exception. We have 90 bikes to get ready and will be having work parties in November and December to make that happen. Christmas House is a 100% volunteer, non-profit organization in Everett, Washington that provides an opportunity for qualifying, low-income, Snohomish County parents to select free holiday gifts for their children age infant – 18 yrs old. Many people contribute to the success of Christmas House – including Sharing Wheels volunteers. Christmas House helps put bright smiles on the faces of over 10,000 children in Snohomish County on Christmas morning. Author Posted on November 13, 2013 Categories UncategorizedLeave a comment on Christmas House is Awesome…. Every year it is hard for me to think about Christmas. It can be a very stressful time with family expectations and demands placed on me all while the days are getting darker. Once we start delivering bikes to Christmas House here in Everett I start feeling better about the holiday. Christmas House serves around 3,000 families in less than 3 weeks. That translates into around 10,000 children. The stress for a single parent to make the holiday special for their children is much more significant than my stress over what I am going to get for my grown brother. Today we delivered another 29 bikes to Christmas House and will do one more delivery next week. We are a very small part of Christmas House but hopefully a big part of at least one child’s christmas hope. Due to the Thanksgiving holiday, Sharing Wheels will close early, at 5 p.m., on Wednesday, Nov. 21 and will be closed all day on Thursday, Nov. 22. Sharing Wheels will also be closed on Christmas Day, Dec. 25, and on New Year’s Day, Jan. 1. We’ve had some great new volunteers at the shop these past few months as people helped us prepare for the Kids Bike Swaps in June and July. 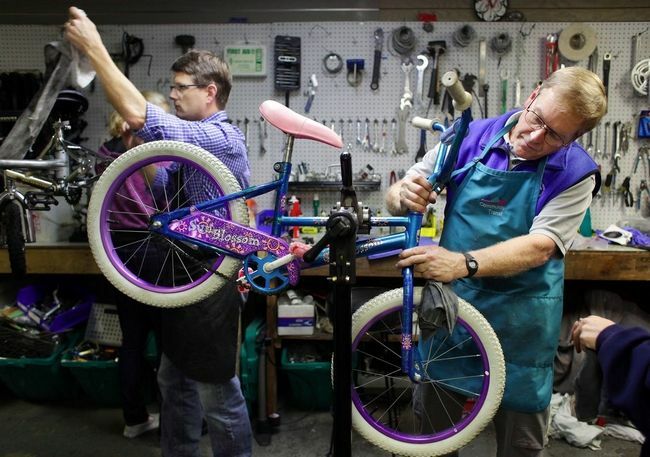 Bikes for kids are a good cause to support, and perhaps people are not as intimidated about working on kids bikes. They sound easy, but in truth kids bikes can take lots of time due to hard wear and cheap parts. For the rest of the summer we’ll take a break from kids bikes* . Volunteers are still needed, however. We fix adult bikes year-round to get them back on the road at a reasonable price – and to pay the rent. A basic principle of Sharing Wheels is that bikes are for everyone. So is our shop. Stop in during shop hours to turn a wrench, help with “paperwork” (might be on our computer), pet Tango or assist with housekeeping, literal or figurative. There’s always something to do and people who love bikes of all types at Sharing Wheels. *See you in the fall when we get bikes ready for Christmas House. Darren, Tony, Anna and Vince with the bike of some kid’s dreams. 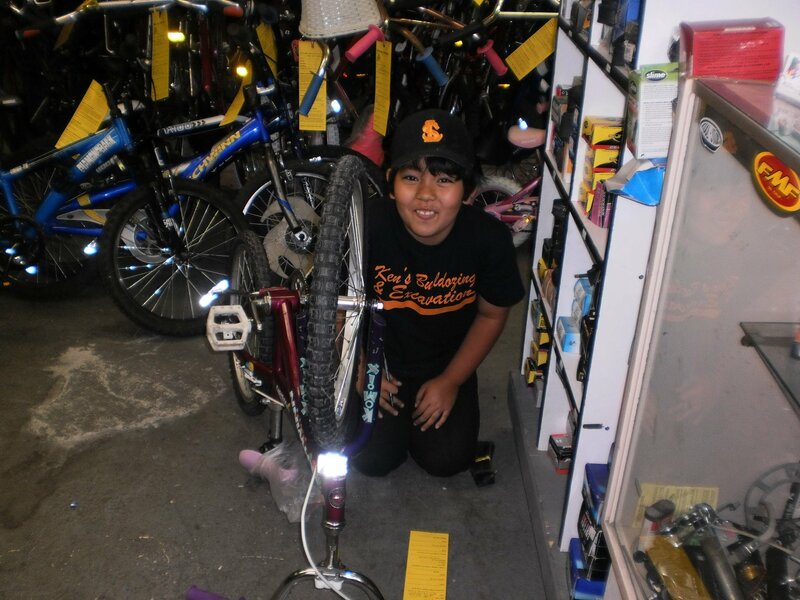 Lots of volunteers in the shop today helping get kids bikes ready for the Kids Bike Swap next Sunday, June 10. Feel free to stop by the shop during open hours this week to get greasy for an hour or two. Kids bikes can be really easy – or really hard, since manufacturers do not generally build them for the long-term. Either way, getting a bike ready to continue its life with a new kid who wants it is very gratifying. Gen’s favorite part of the work party was test riding bicycles. But he also learned where to find serial numbers for the bike tags. You also get to use tools you don’t usually pickup in a bike shop – this Huffy had a hammer taken to the wheel, along with vice grips. And some hairspray for the new grips. There’s something for all skill levels to do, from pumping tires to adjusting a loose hub. You learn a lot working on kids bikes, including how heavy they are! 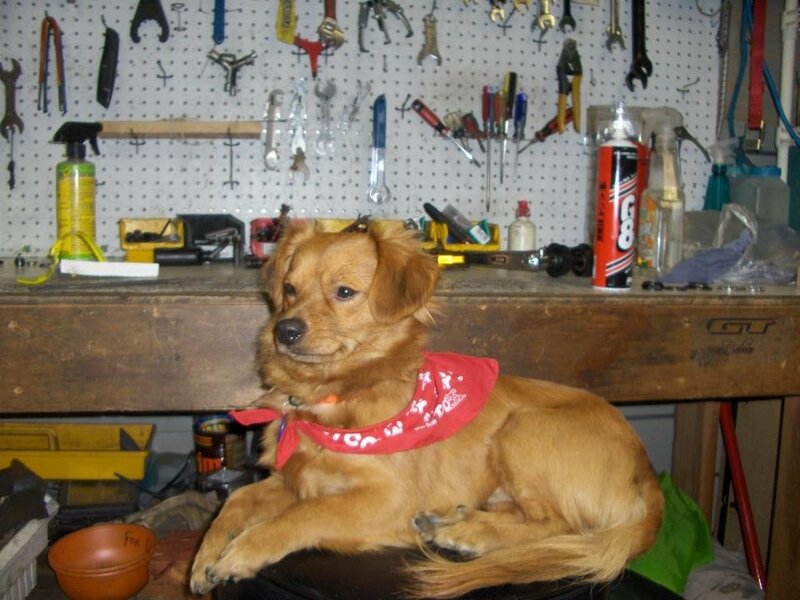 When you come to the shop, don’t be surprised to be greeted by the cutest little critter this side of canine. But, if you tell him to “dance,” he just might do that. He’d also be happy to chase a ball or eat some grease off the floor. That’s Tango, the shop dog. Some days, he arrives by bike. He rides, but he doesn’t pedal. If his mom is riding up a hill, she might kick him off the bike and make him run alongside. That makes Tango happy. So does hanging out with Sharing Wheels volunteers. P.S. 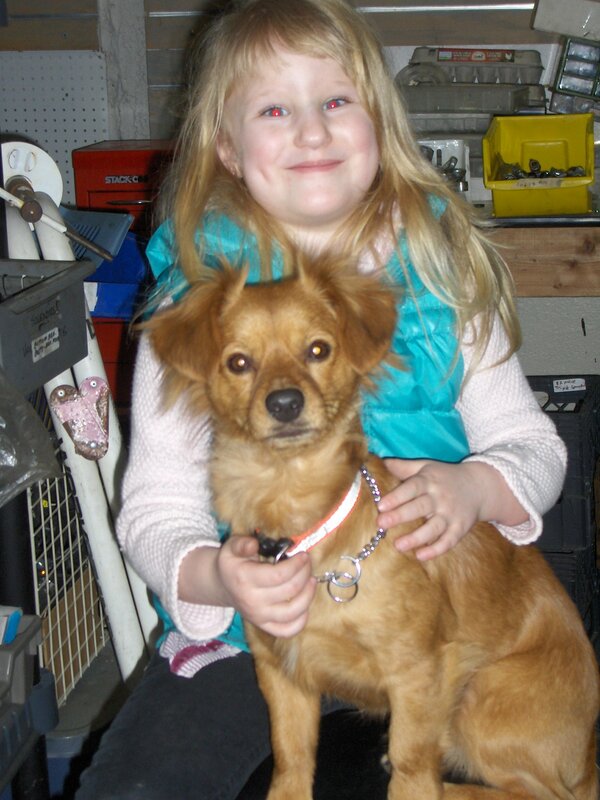 – If you ask Kristi, “What kind of dog is Tango?” she will tell you he’s a “golden wow-wow.” That means a mix of golden retriever and chihuahua. Or is he a daschund-chihuahua, also known as a “chi-weinie.” Ah heck – he’s a mutt!